Tucked away in the mountains of northern Maryland lies a hidden gem not visible to the naked eye. A combination of fine attention to detail and a deep appreciation of outer space has Yugen Tribe of Emmitsburg creating intricate keepsakes and jewelry for people around the world. With the ever-growing influx of business opportunities and demand of production, Beacham decided to branch out. She put the fourteen-hour workdays behind her, bringing in fellow science enthusiast Brittany Elbourn to help balance the vast needs of the business. Between handling personal items for customers and the nearly six-month-long production boom for the holidays, the women of Yugen Tribe continue to find time to design new and interesting pieces for jewelry lovers everywhere. In addition to the space-themed necklaces and bracelets, Yugen Tribe has worked on a line of heirloom pieces that provide special memories for their customers. Despite all of the personal success for the duo, there has always been a major focus on giving back to the community and growing businesses. “One of the other things I really like doing is supporting other small businesses, especially women-owned businesses,” Beacham said. Yugen Tribe gives back quarterly, donating money to various organizations, including The Planetary Society, The Nature Conservancy, and The National Humane Society. Developing a new business and taking the plunge to put all efforts into a new business can be a daunting task. For Beacham, her skill set gave her a unique talent that turned her ideas and creativity into a profession. Space-inspired jewelry is a hard market to crack, but fortunately, she has learned quite a bit along the way. For more information about Yugen Tribe, please call 240-415-8137 or email hello@yugentribe.com. 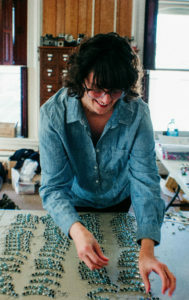 Pictured is Lauren Beachman, Yugen Tribe creater and owner. 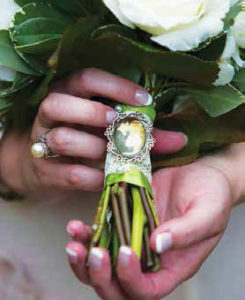 A bouquet charm, one of the many unique keepsakes and jewelry designed and created at Yugen Tribe.